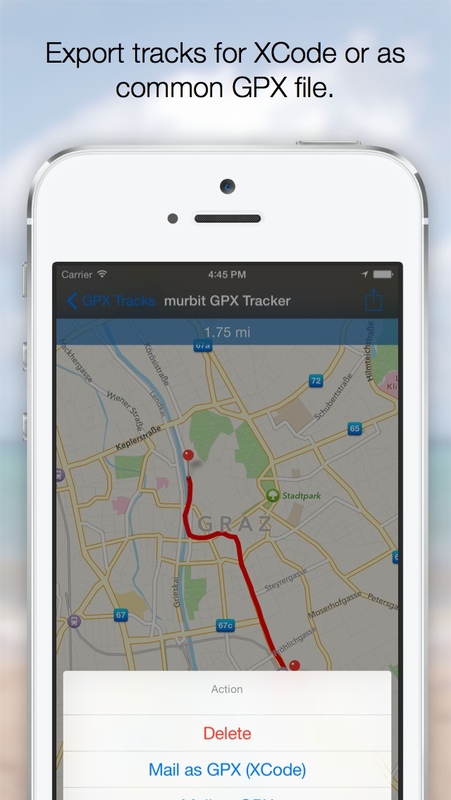 GPX Tracker is a simple to use but powerful tool that helps you to track your ways. If you drive a car, biking or even outdoor on a walking or hiking tour, GPX Tracker will be tracing your geo data. Once developed as a creator for XCode compatible GPX formatted files, the feature list is growing but it is still as simple to use. GPX Tracker has a simple configuration interface. Accuracy – Move the slider from low to high. The higher the accuracy, the more track points will be logged. Auto Stop (iOS 8 only) – If you ever forget to turn off the recorder, don’t mind. 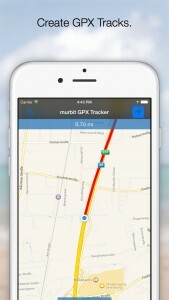 GPX Tracker figures out whenever you stop traveling and stops tracing your trip to save energy. Reminder – If this feature is turned on, you will receive a message whenever you stop by for a few minutes to remind you on stopping the track tracing. The main screen has a start/stop button. Simply press this button once for tracing a new trip and a second time whenever you want to stop recording data. On the top of the screen, you will see the traveled miles or kilometers depending on your locale system configuration. 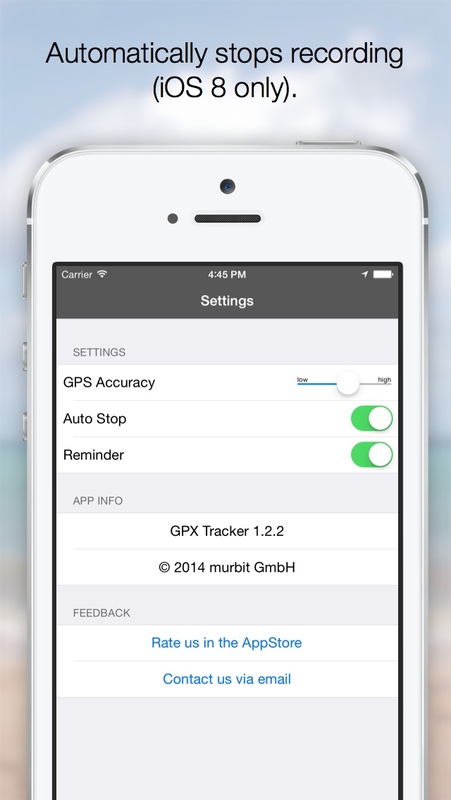 With the menu bar item on the right side you can choose different user tracking modes for the maps. The Tracks screen provides a list of tracks recorded. The will show the date and time of recording, the duration of the trip and its distance. Back in the Tracks screen, you can easily delete a recorded track by swiping the desired item from the right to the left. There are two output formats available. XCode compatible “wpt”-tag based GPX files. This format can be used for the iOS Simulator by added the generated gpx file to an XCode iOS Project. Common GPX “trk”-tag based format. The track will consist of a collection of “trkpt” tags within a “trk” element. This format should be fine for any application that processes gpx tracks. 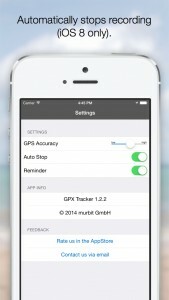 GPX Tracker is free but ad supported. 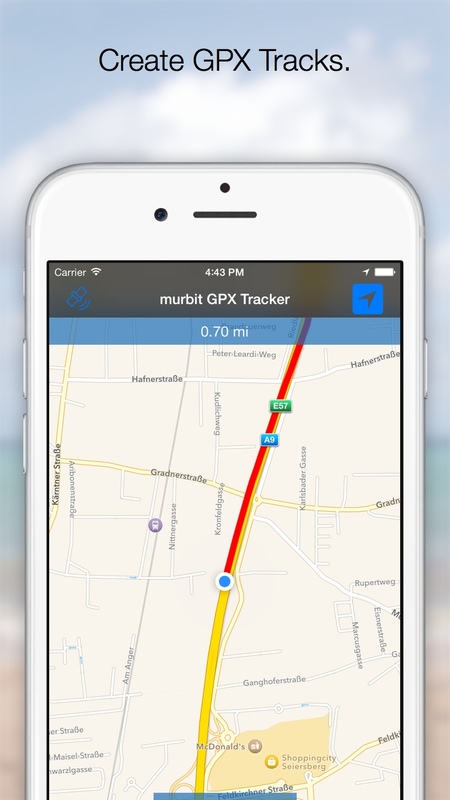 If you want an advertisment free version, you may want to by “GPX Tracker – Simple Tour Tracking”.